We all know the power of darkness—it is in the news every day. A thousand times over is the power of light. 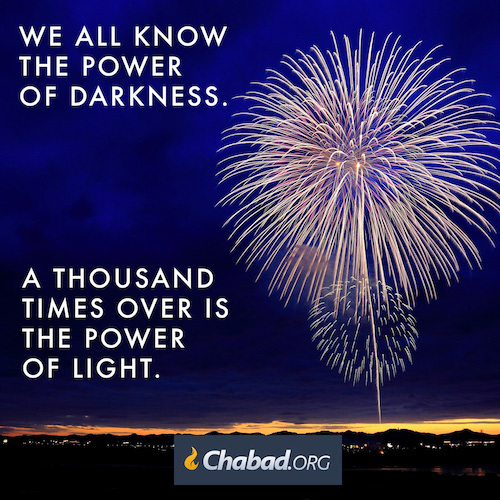 A busy person stopping to do an act of kindness, a small child reaching up to kiss the mezuzah on the door of her room, a flickering candle for Shabbat or Chanukah—each of these are as bursts of light in the nighttime sky. True, they rarely appear in the daily news. But the darkness of yesterday’s news will pass like the shadows of clouds on a windy day. Light endures forever, accumulating with every flash, until no room is left for darkness to hide.